China Seeks Soft Power Influence in U.S. Through CCTV China Central Television's American offshoot has set up shop just two blocks from the White House. Some say the government-owned English channel is helping redefine acceptable media coverage in China, while others see it as a soft Chinese power play. Before joining CCTV America, Phillip T.K. Yin was an anchor and reporter for Bloomberg Television. At a time when so many major American news organizations are cutting back, foreign news agencies are beefing up their presence abroad and in the U.S. One of the biggest new players arrives from China and, more likely than not, can be found on a television set near you. CCTV, or China Central Television, is owned by the Chinese government. With more than 40 channels in China and an offshoot in the U.S., the broadcaster has been highly profitable for the country's ruling Communist Party, which is liking profits a lot these days. 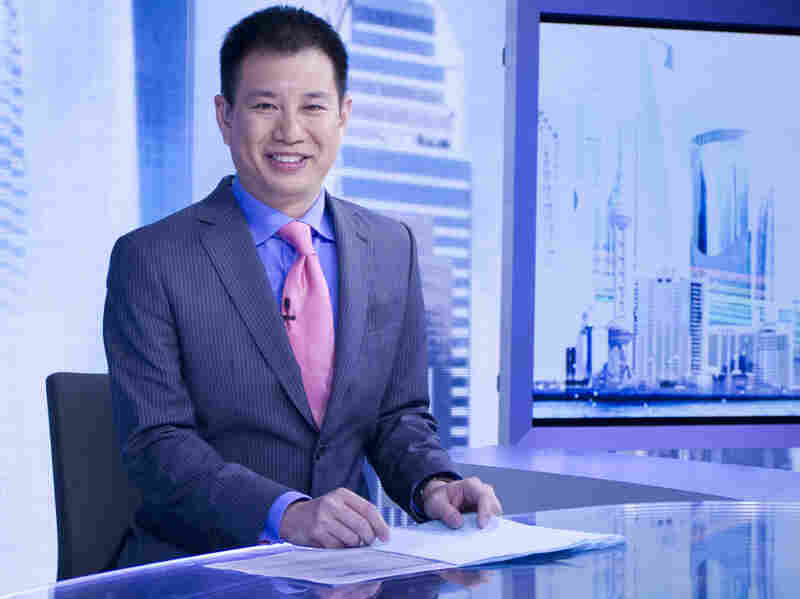 CCTV America Business News Anchor Phillip T.K. Yin was born and raised in the U.S. by parents who emigrated from mainland China. Yin used to work in investment and for CNBC and Bloomberg. He says he is mindful of the tension between the American tradition of an independent press and Chinese expectations that the media serve the state. And yet, he says, CCTV America has broadcast interviews involving allegations of major computer hacking incidents originating in China — hardly a flattering story. "It's changing very quickly," Yin says. "I can tell you even from the time that we came onboard here to where we are today, we've changed a lot. We're covering stories from sometimes very controversial angles." CCTV America has its home in a new building just two blocks from the White House, in the heart of Washington, and it's carried by cable providers in New York, Washington and Los Angeles, among other big cities. At one point, CCTV America had a larger reach in the U.S. than Al-Jazeera America did, at least until the Qatari channel acquired Current TV earlier this year. "We see what the British have done; what CNN has done for years. We need to be part of that," Laurie says Chinese executives told him. "China is a big power; the state broadcaster is a big company. We want to be part of that dynamic." Laurie also knows about another dynamic — one familiar to reporters who have worked in China over the years. In 1989, he witnessed China's bloody crackdown on the student protest movement. "I've been arrested in China. I've covered demonstrations in which film was confiscated," he says. "On June 4, [1989,] I was there for the Tiananmen massacre. So yeah, it was a pretty heavy time." Laurie acknowledges CCTV America is unlikely to air an interview with the Dalai Lama's criticisms of the Chinese regime. And yet more than two decades after Tiananmen, he says a new generation of government and media officials is out to increase international commerce as well as the free flow of information back and forth, especially about business. Orville Schell, a veteran journalist and founder of the website ChinaFile, sees a somewhat different dynamic at work: the Chinese state seeking to exercise soft power, a way to project influence through ideas and culture rather than the display of military might. "This fixation on soft power arises from their deep and abiding insecurity and sense of not being respected and of being hectored and bullied by the world over the last century and a half," he says. According to Ying Zhu, a professor of media culture at City University of New York's College of Staten Island, the network has sought to incorporate Western journalism standards by sheer force of numbers, hiring dozens of staffers from ABC, Bloomberg, CNN, the BBC and similar outlets. But, she says, there's one catch. "What's missing conspicuously from these programmings are actually any real political news about China itself. CCTV America unfortunately can't really reveal anything that's beyond [the] scripted version of what happened in China. CCTV America is very much on the party's short leash." But at CCTV, journalists like Yin argue the channel is helping redefine what acceptable coverage is in China, at least on the English-language channel. "I invite any of the viewers to watch us and listen to the interviews and listen to some of the perspectives that we have, because it's certainly not one-sided. It's very two-sided. Sometimes, it's even three-sided," he says. It's hard to gauge the size of CCTV's audience in the U.S., but the size of its ambitions is unmistakably global.